The Renaissance building in Riez, Provence in France is an elegant example of the architecture of the 14th to 16th centuries. 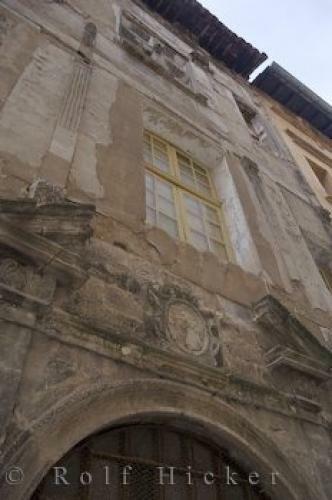 The facade of the Renaissance building at 27 Grande Rue in the village of Riez, Provence in France is an elegant example of the time. The 14th, 15th and 16th centuries produced this lovely classical architecture.Renaissance architecture of Number 27 Grand Rue in the village of Riez, Alpes de Haute, Provence, France, Europe. village of Riez, Provence in France, Europe.